It's confusing I know. I have planets on only with markers on and off with markers off. I want to disable only the procedural ones via show objects menu but it doesn't work. If I put markers on I have ALL planets if markers is off I have NO planets. Ok I am now totally confused So that I can compare my experience with your, please take some screenshots of a procedural planet of a catalog star showing your menu with the same options as I have in mine. I think I figured it out. Actually I can disable planets separately. I can't disable orbits and markers separately. For example if I am on Betelgeuse with procedural planets disabled and orbits enabled I still see five orbits which is a bit confusing but if you zoom in there is no planet which is correct. So the problem is actually that the orbits and are shown for disabled planets too. And if then I turn markers on the planet appears again which it shouldn't because it's a procedural one. This would be nice to be corrected in the future. And thank you for your assistance. If you take the last screenshot with orbits and markers enabled you will still see the planet. Which makes sense. Orbit rendering is specified separately from planet rendering, as they are two different things. There is a whole list of orbit options where you can select which objects have orbits displayed. 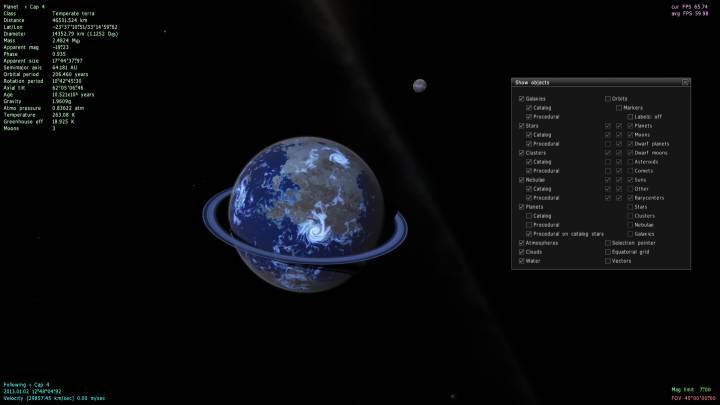 Simply uncheck the planets box if you want to not see planet orbits. And if then I turn markers on the planet appears again which it shouldn't because it's a procedural one. This would be nice to be corrected in the future. That is something I can understand wanting to be fixed, but realistically it would be odd to have a planet rendered as a tiny dot marker even if you are very close to it. Still, I suppose having the option would be nice. Yes of course, but you seemed to be saying that you had problems with planets displaying properly even when markers were off, which is why I did those screenshots. By „this” I meant the orbits rendered for disabled planets and the fact that if you keep markers on the disabled planets are still rendered. It can cause confusion, certanly for me it did. By „this” I meant the orbits rendered for disabled planets and the fact that if you keep markers on the disabled planets are still rendered. I know what you meant. And like I said, maybe it can be confusing for some, but it also makes sense for it to work the way that it does (with the possible exception of the markers). Razvan, you probably have a system with dual graphics. 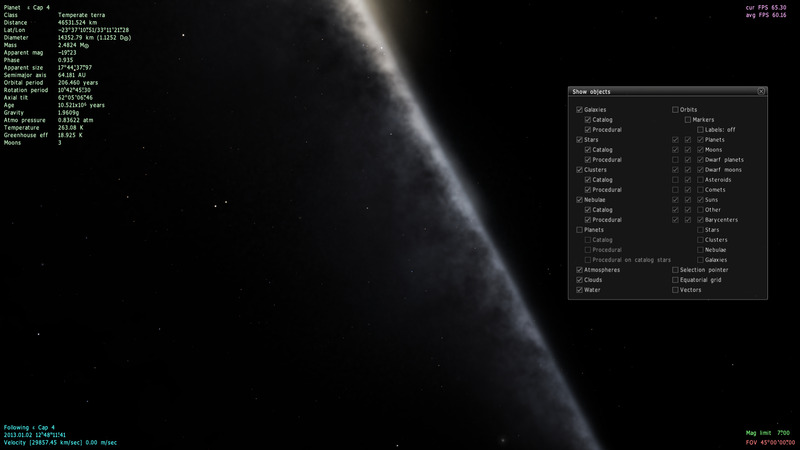 Try open NVidia control panel or ATI Catalyst and create a profile for SpaceEngine.exe to force it run on the NVidia or ATI graphics card, not Intel one. Razvan, you probably have a system with dual graphics. Razvan's log clearly shows him running on an Nvidia card, and he has no Intel-like bugs. I think maybe you mean stafferoinen? stafferoinen. The advice you were giving was not applicable nor related to Razvan's problem, so I thought that maybe you meant to address stafforoinen. I don't have dual graphics. The problem it's not specific to me it's just how the program works. It still shows orbits for disabled planets which is a bit weird. I don't see the point of showing orbits for non-existent (disabled) planets. I don't see the point of showing orbits for non-existent (disabled) planets. Well you're not really disabling the planet, you're just disabling the rendering of the planet. It's a graphics/display option. The planet is still considered to be there. I can never load the simulation. It's fine until "WARNING: TMemoryManager::UpdateAvailableVRAM(): Can't determine available video memory size". And the loading screen keeps looping between "Creating mesh" and "Creating texture". Creating cluster model "NGC 6712"
Pipcard, press Esc to close the loading screen and fly away from the planet.